Web governance is all of the policies and procedures which go into maintaining and managing a website. All websites have a system of web governance in place. When done right, your web governance system can catalyze business growth. In order to make your web governance work, you need a clear model which outlines how activities will be completed and with what resources. But, just as importantly, you need clearly-defined web governance principles. We probably shouldn’t need to differentiate between principles and rules. However, in a lot of discussions about web governance, the term “principle” gets thrown around a lot when the person is really talking about rules. A principle is an internal motivator. It drives you to do what seems good or right for the organization or business. A rule is an external motivator. It compels you, through threat or punishment, to do the things that someone else has deemed good or right. Principles provide guidance that can be applied to the many variations in circumstance that arise in everyday practice. Principles are flexible and can quickly adapt to the rapid changes that modern businesses experience. Principles focus on guidance and encourage responsibility in the exercise of professional judgment. This isn’t to say that you shouldn’t set clear web governance rules which apply to certain tasks or procedures. Rules are guidance on principles! But don’t make the mistake of setting web governance rules without first setting the underlying principles. With this in mind, here are 7 web governance principles to adopt in your business. When NETmundial met in Sao Paulo, Brazil in 2014 to identify a set of universal principles to be promoted worldwide, one European Commission contribution discussed problems with confidence in the internet. Problems like identify theft, fraud, and other cybercrime have caused users to lose confidence in the internet. Without confidence, the internet will not be able realize its potential for growth. Thus, clear governance is needed to address issues so users can regain confidence in the internet. For example, no one would buy things online if they didn’t feel confident that rules about online payment processing are effective. The same applies to your website. If users don’t feel they can trust the content on your website, your website will not be able to help your business growth. An extreme example would be if you have downloadable content with malware in it. If users download what seems like a useful PDF but really get a virus, they aren’t likely to download anything from you again. A more common example of lack of confidence would be if you have broken links in your content. Users click the link thinking they will be taken to something useful or relevant and instead get a 404 error message. The effect isn’t as severe as the malware example, but it still deteriorates the users’ confidence in your website. Unfortunately, many websites are built as an afterthought to the main business. This is unfortunate because, to be successful, a website must have its own business plan. Use your website business plan to define success. Once you have defined success, you will find that the other areas fall into place more easily – like the steps which need to be taken to manage the website and measure and evaluate its efficacy. As content strategy expert David Poteet of Inside New City says, “Everyone needs an editor.” No matter how good of a writer you are, you still need someone to review your work and help you make it better. And any large institution needs a “central managing editor” who can establish a content strategy and override lower-level decisions if they are counter to the institution’s goals. We can take this further. It isn’t just the content creators who need an editor. Anyone who works on the website – whether their job is blogging, SEO, or design – needs someone who oversees their work. Even the managers need a central manager. This can be achieved by mapping out your website governance structure so roles are clearly defined. As we talk about in our article about What Is Web Governance, web management is not the same as web governance. However, having this structure in place ensures a clear system of accountability. At the top of the structure is one manager or committee which ensures all of the objectives of the website are being met. How does the central manager or committee ensure that all objectives are being met? This is where reporting comes in. Information must be available, and it must be regularly analyzed in order to make decisions about improving the website. One example (shameless plug here ) is the graphs in the Monsido web governance tool. The graphs show the health of the website over time. These graphs make it easy to see how team members are doing in terms of maintaining the quality of the website and SEO. This web governance principle specifically applies to Accessibility. Approximately 15% to 20% of the world’s population has some form of disability, yet only a small percentage of websites are designed to be accessible to disabled people. Many nations have now stepped in and made it a legal requirement for certain types of websites to be accessible. Aside from legal compliance, there are many reasons to improve web accessibility, particularly because it increases your audience and also improves website quality. Learn more about what is web accessibility and why it matters for your website. Web governance isn’t something that you only think about during a once-yearly cleanup of the website or during a redesign. While your principles, procedures, and policies may not change (often), the governance should actively continue. If a city was having a problem with crime, you wouldn’t expect the mayor to hire some more police officers and then forget about the issue, right? You’d expect the mayor to monitor crime levels to see whether the increase in the police force was having any effect. Likewise, your website needs to be carefully monitored. Rather than trying to fix everything at once, content strategist and marketer Josh Tong suggests using the small content strategy. In order to do this, you will need to identify your resources (people, tools, processes, budget) and work on strengthening one or all of them. This goes with the previous principle. Since governance is an ongoing process, you should also expect to invest in ongoing training to improve outcomes. Everyone involved on your website should not only understand the principles guiding the website, but feel empowered to work on it effectively. A CMS is one tool which can help you carry out your web governance model. However, your CMS cannot enforce policies, review effectiveness, or drive your website in the right direction. This applies to other tools too. 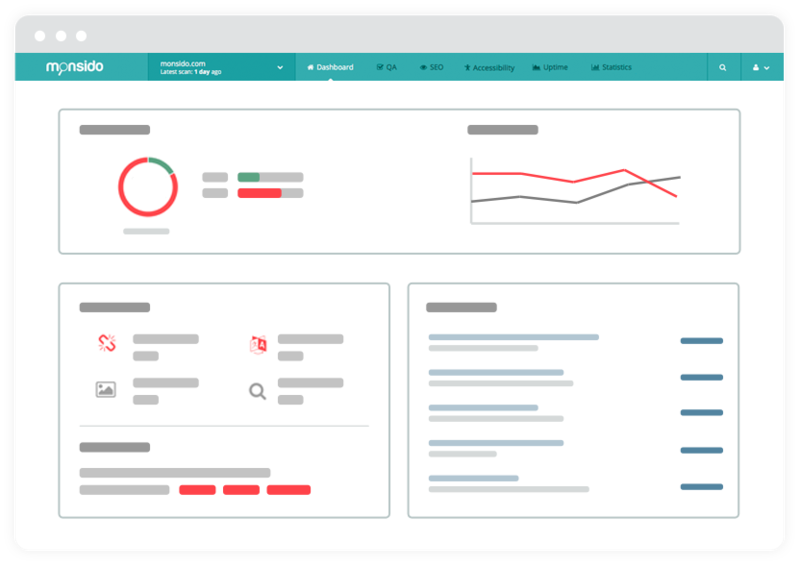 At Monsido, we make a web governance tool which can do wonders in helping you helping you improve website quality and SEO, manage users, and assess results. Our tool can also help you free up resources, such as by saving your staff valuable time. However, we are ultimately a tool. It is up to you to establish a web governance model and determine how the tool will be used as part of the ultimate goal. Want to learn more about how the Monsido tool suite can help you with web governance?